How Soon Can I Start Making My Cake And Ingredients? Need to know how far in advance you can make the ingredients needed for your cake? 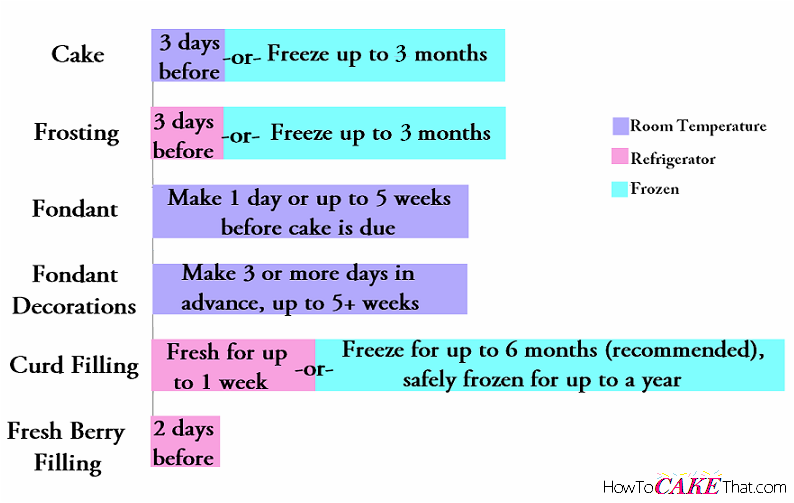 The chart below shows how many days, weeks, or months ingredients can be made before your cake order is due. Most ingredients can be kept either fresh or frozen, so this chart is color coded to show how your ingredients should be stored and for what length of time. Due to the large number of possible ingredients for cake, I've only included a basic list of ingredients. Fresh cake can be baked 2 to 3 days before your cake is due. Or cake can be made fresh, then frozen for up to three months. Cake can be frozen for longer (up to a year), but begins to lose quality after two months, and I do not recommend serving cake to customers that has been frozen longer than 3 months. I do not recommend freezing cakes with frosting already on them, if serving to customers (it's safe to do, but should not be done to cakes to be sold) - when frosting thaws, it almost always needs to be lightly mixed with a mixer to return to a good consistency. If cake contains fruit or dairy ingredients, cake should be either refrigerated or frozen. Fresh frosting can be made 1 to 3 days before cake is due. Keep in an airtight container and refrigerate. Or frosting can be frozen for up to three months. Frosting can be frozen safely for up to a year, but begins to lose quality after two months. Frosting frozen for longer than three months should not be served to customers. Fondant can be made 1 day before, up to 5 weeks before cake is due. To store fondant, wrap well in plastic wrap, and place inside an airtight container. Keep at room temperature, away from sunlight. Fondant or gum paste decorations can be made the same day as decorating a cake (if they don't need to dry), but if they do need to dry, begin making them at least three days before the cake is due, up to 5+ weeks before. Store completely dry decorations in a container or cardboard box to protect from dust. For modeling chocolate decorations, these decorations can be made the same day as decorating the cake, or up to several weeks before (be sure to keep them in a cool environment in a container with a lid). Modeling chocolate will stay fresh for up to 3 months if stored properly (wrapped in saran wrap, in airtight container, in cool environment). Fresh curd filling can be made up to 1 week before cake is due. Store fresh curd in an airtight container and refrigerate. Or curd can be frozen for up to 6 months. Curd can be safely frozen for up to a year, but it starts to lose quality after 6 months. Fresh berries are highly perishable. Prepare fresh berry filling as close to cake's due date as possible. After Ingredients Are Made, When Can I Assemble My Cake? I will be modeling any fondant, gum paste, or modeling chocolate decorations for the cake. If there are a lot of decorations to be made with a lot of detail, I'll begin working on them as early as 3 weeks before the cake is due. Wednesday will be spent baking the cakes, and making my fondant and frosting. Thursday morning or afternoon will be spent assembling my cakes and making curd or berry filling, if using. I will first make my fillings. And then I will fill my cakes, then crumb coat and place them in the refrigerator. After they've chilled for at least an hour, I will cover them in fondant (or the final coat of buttercream if doing a 'buttercream only' cake). I will also attach any non-dried fondant decorations to my fondant cake at this point. To store my fondant cake, I will place it in a cake box and keep in a dark cool area until the next morning (fondant cakes should not be refrigerated, and therefore should not have perishable filling). If my cake is a buttercream cake, I will place it in a cake box and store in the refrigerator overnight. If there are fondant decorations to be used on the buttercream cake, wait until the next day, just before delivery, to attach them. Friday morning is dedicated to putting the final delicate touches on the cake. For fondant cakes, add any dried gum paste or fondant decorations. For buttercream cakes requiring fondant decorations, remove buttercream cake from refrigerator and let rest at room temperature for at least 45 minutes. Apply fondant decorations as close to delivery (or pickup) time as possible. Keep at room temperature.